“So how should I / we dress?”, or “What kind of wardrobe should I wear?”. My stock answer is, what’s the purpose of your photos? Along with that particular question, let me address some other minor points that will ensure we get exactly what you need out of our time together. If this is for a modeling portfolio, my suggestion is to search the modeling agency’s site for their current lineup of models. Be the model you want, and what would fit their look and feel. This could end up being a fashion look, chic, fitness (if you’re looking to build a fitness portfolio) or a simple wardrobe that’s going to accentuate your figure or put the focus on your features. Are we shooting for brand ambassadorship? Wear that brand and the right accessories. Is this a seasonal / swimsuit session? Don’t forget your tan lines. While most of them can be edited out in post production, you’re going to want to even out your skin tones as lines will still be apparent even with the magic of Adobe. For the editorial or environmental session, I’m going to suggest a wardrobe or outfit that’s going to represent your day-to-day style. It can range from a dress or skirt to a business formal look; jeans and blazer, or slacks you’re comfortable in. For this purpose, dress as if we’re documenting you on the go. Accessorize appropriately- hand bag, hat, sunglasses, etc. For a family photo session, you’re going to be looking back on these pictures for years to come. When you look back on candid holiday pictures from days gone by, wardrobes and outfits can appear dated. Unless this is a fashion shoot, I don’t want us to be calling attention to current fashions so much as we’re taking pictures of people- so the focus needs to be on you rather than an outfit. Bottom line, my suggestions are going to be fairly straight-forward: wear timeless clothing. That again could be simple slacks / khakis, jeans or other pants, skirts or dresses that aren’t going to necessarily be a time capsule shot. For tops, again, less focus on flash and more about a complementary look. Single and looking to build that New Year’s dating profile? Yes, you’ve come to the right place. Bear in mind, you’re going to want to present yourself with desirable recent pictures. Keep your ugly sweater day entry in the dresser drawer, and accentuate your face and skin tones. Dress to show off your body’s features… don’t be overly revealing, but portray yourself appealing and don’t wear a tent. The idea of these photos are to sell yourself. And don’t worry, we’re also taking tasteful shots you can use on more traditional social media for a freshened-up profile picture. I’m a big fan of these sessions, as when done right, they’re going to give you attractive head shots, a dating site portfolio and fun shots you can share with friends and family. Another important aspect is grooming. If you’re going to use a makeup artist (MUA) or apply your own, it’s going to help out dramatically in setting up your mood and focus for the day. As you’re having your makeup applied before the shoot, take advantage of the time to conceptualize the types of shots you’d like. We’ll go over your ideas and the overall style when it’s time to step in front of the camera. Style your hair so that it’s complementary of your outfit and fits in with the goal of your session. If this is a casual session, beach look, or fitness, your hair could look playful. If we’re building your modeling portfolio or this is a family session, a more finished look is appropriate. If you’re applying gels or hairspray, make sure it’s evenly applied and you don’t have clumps and be careful of flakes from dried gel or spray. I have faced that unnecessary challenge, and I can say it’s not fun to deal with! Clothing should be clean, pressed, free of lint, pet hair and loose threads / strands. I have been through too many sessions where lint balls and dog hairs have bogged down post production… which can cause a delay in turning the pictures around to you. Shoes should be clean and in good condition, important if we are going to take a full body shot. Get a good night’s sleep the night before, and take it easy on the alcohol. Showing up exhausted with bloodshot eyes and bags underneath, your energy will be tapped for our time together. Your posture will suffer, facial expressions will be blank and overall it will diminish what we’re trying to accomplish. These are some pointers and ideas that you can use when we set up our session. As well, if you have any questions leading up to our appointment, I urge you to call or shoot me a message. One way to enjoy yourself, stretch your boundaries and grow in your journey is to take on a personal project, such as a collaboration. It can be with a fellow photographer - or in my case, an artist! I was lucky enough to be able to photograph a local artist and educator, Melissa Maiello, busy in her studio at The Studio at Suite Pieces. It was a chance to both document an artist intently focused on her work, while observing the skill and vision being executed in their style. This was also a fantastic opportunity to see the effort and time that's spent behind the scenes as they get their idea or concept onto a canvas or paper. During her session, Melissa was working on three projects she's been spending time with in the charcoal medium. Her workflow took her from one piece to the next, so she could keep her mind fresh so as not to obsess (something to try in my own workflow for post-processing images). 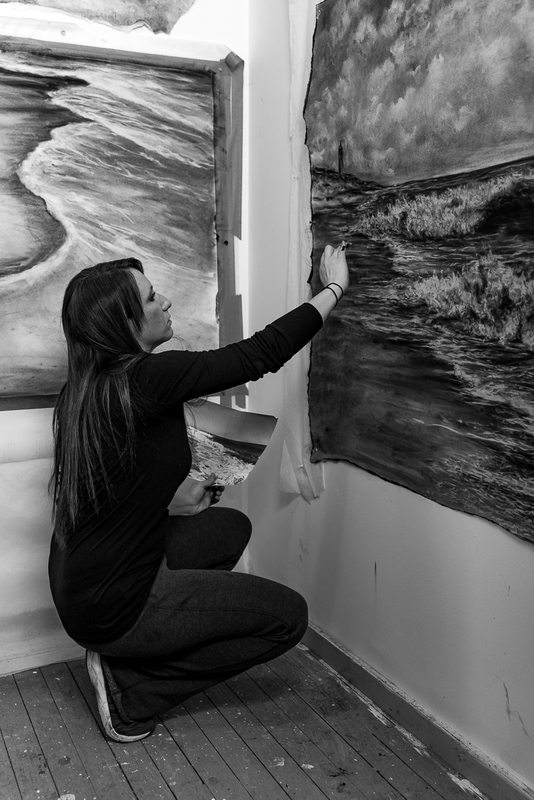 Melissa currently has a studio full of large-scale charcoal drawings focused on seascapes and a historical seaside fort. Her style is multi-dimensional, with attention paid to fine details and layers that create an emotional, rich depth. While photographing her in action, there were moments I had to pause in order to take mental notes on her creative technique. There are details and nuances in her scenes that are pleasant to study with a critical eye, but don't necessarily convey the intricate level of work to arrive there. It's not a surprise at all to understand her work has been featured in local galleries and recent showcases. Now having this experience under my belt, I urge anyone looking for fresh ideas, new motivation or a change of pace to reach out and connect with someone you admire who can give you inspiration and act as a muse. Not only will it provide you with a creative shot in the arm, it can also open up new channels to those invaluable networking possibilities. Furthermore, it will give you a chance to try out new techniques or help you get to know any new gear you've picked up. For me, it was getting additional practice with a fairly new lens while also incorporating a flash and umbrella combination in a journalistic, on-the-fly situation. This will only help for location-based work where time is precious and a client's time is valuable. One of my goals for the year was to take on a personal project. Over the last couple of months, it's taken shape as I've laid the groundwork to collaborate with a number of people in certain creative settings; the theme is capturing artists of many forms. Melissa's session was the first in a series that will be shared here as well as well on Facebook and Instagram. So stay tuned, pay attention and reach out if you have any desire to participate as well!. As you take on more work and projects, you'll evolve and learn as a side benefit. Your networking will lead to inquiries, requests and beneficial conversations that are golden opportunities to get invaluable exposure. Taking on work that sits outside of your norm is fine; as at the end of the day Photography is Photography. It's always a positive experience to deliver a finished product when your customer is happy and you're proud of the end result. Bottom line, you can always take on projects to help build relationships, establish a presence and become a trusted resource and partner. Take on personal projects when you're testing techniques, working on lighting, or filling in gaps of your portfolio. Recruit those closest to you - it's a way to connect, laugh and have some fun. A huge benefit is that you can document your growth as well as theirs (especially in the case of kids). I like to think of these opportunities as a chance for free marketing and expanding your word-of-mouth network. The last month has been busy in winding down from New York Fashion Week, curating, sneaking in some outdoor portrait work in between the raindrops, addressing storage needs and something more tangible to you - re-branding this site. Thanks for your patience and thanks for stopping by. As with the hints above, we'll be seeing some business marketing work in the very near future, as local and urban networking will bear its fruit. Stay tuned! As I start to ramp up my schedule in arranging shoots, networking, contacting models and even landing a pair of credentials for New York Fashion Week, the need for planning is key in executing the game plan while building a process for the behind-the-scenes aspect of photography. As you would learn, the hardest part of getting yourself off the ground isn't the time spent behind the camera. It's when you're acting as your own business manager, secretary and communications coordinator. It goes far beyond camera bodies, lenses and memory cards! The first step in filling the calendar with shoots and meetups, as well as other photography-related events, takes just that- a proper desk pad calendar. Sure, the calendar app on your phone, Google or other online calendars are essential as you're constantly on the go and need to sync your master schedule. But at the end of the day, it pays to go analog and pick up a desktop calendar to help flesh out your appointments. And don't forget to include your personal obligations, or you'll need to bump, move or worse cancel important engagements. The visual aid (photography, remember? ), as well as the repetitive nature of physically jotting down your shoots and meetings feel a little more tangible and gratifying than solely keeping everything in cyberspace or on a phone dependent on a charge. This *major* addition to my arsenal ran me less than an iPhone Lightning Cable! Now... onto what's on tap! The main highlights take place mid-month, as we're looking at a pair of events that will be a first for me, during New York Fashion Week. The first show, ASC Fashion Week takes place February 10th. The following Friday, I've been granted all-access to the New York Fashion Gala for Exalt Fashion on February 16th. That said, there's a few model shoots thrown in for good measure- so be sure to check back here, Facebook and Instagram as always. And for some street photography, you can also see my personal IG project page as that is a passion of mine. Attacking your goals involves stepping outside of your comfort zone. That in turn, enlarges your comfort zone once you see progress and success. I'm not a fan on limiting goals to a calendar year, but there was a fresh approach heading into 2018 by a coincidence of timing and the convenience of the season. I'm looking at a pair of unbelievable opportunities in February, in addition to taking on clientele and other personal projects during the short month. All it took was jumping outside of the comfort zone, acting while others seem to be resting or waiting out the winter. The tracks laid in January will be traveled in a busy month ahead. Pay attention here, Facebook and Instagram. There are fun projects ahead; new collaboration and further groundwork to lay down. The line between your main profession and your recreational pursuit is marked by a separate energy and focus required for each of them. The same applies to photography. In my personal transition there is going to be the specialty area that I work toward and the personal projects or work that I do to release and have fun with. In training myself to have a focus on the specialization of portraiture and modeling and the business side of those areas, I'm learning that I need to maintain a balance and keep my documentary style in place as well. As I have a camera on me most every day throughout my travels, it's easy to pop the lens cap off, power up and capture. I can opt to do a photo walk when I have spare time; and during those brief stretches of time I can put my earbuds in, hit either a playlist or run off an album or two of John Coltrane and just tune out the hundreds of people around me in my surrounding area. It just works. I let it happen. I make it happen. Zoning out and creating your tunnel vision, fueled by an emotion you may be experiencing can be a game-changer. It can be how you start to focus on achieving a look or creating a story. But for me, I need to be passively consumed by this process to the point that people and ambient sounds are white noise. A couple of hours can pass in this mindset, and the only thing I need to make sure I'm paying attention to are crosswalks and cars. The phone may ring and I may have a conversation I won't remember (it's happened! I only hope I didn't commit to something on that call that's now missing from my calendar....). I may get home an hour or so later than I wanted to since I'm pushing my timeline back. But I'm making sure I find the time to keep my side projects alive and I can maintain the balance and enjoyment. It's alright, the other goals are being worked on due to planning and a schedule. This is about getting a little lost, about breaking free for a bit of time.